Every year Paris opens its doors to the glorious celebration of creativity that is Paris Haute Couture Week. A whole week dedicated to everything glamorous, beautiful, unique, and expensive within the world of fashion. These are the great fashion houses that influence and direct how the fashion industry develops. Chanel, Christian Dior, and Givenchy are just three of the fashion houses showing off their latest and greatest creations. 100s of hours of work will have gone into each design, made with the utmost care and creation. The epitome of what humanity can do when allowed to be creative with fabric. But what is happening behind the catwalks, models, and outfits? What can we learn from this very selective group of fashion houses and designers? Okay, so today the likes of Chanel and Dior are big business. They turn out perfumes, bags, dresses, jackets, and so on. Sometimes the list can seem endless. To those with little or no interest in fashion, they just become one big brand. Household names, not leaving any room for the little guys. And it doesn’t help that haute couture is the most expensive way to buy clothes, making them unattainable to most of us. But just take a minute to think about the history of some of these fashion houses. Take Chanel for example. This particular house takes its name from the woman who founded it. Coco Chanel realised her fashion and business ambitions, managed to reimburse her investors and take full control of her company, and become an established couturier. Though she did this with the backing of and connections in the aristocracy, she was the one who opened that first boutique. If she had opened that boutique today, she would have been praised for creating a unique and independent new brand and style. She demonstrated that when a woman puts her mind to something, amazing and incredible things can happen. More often than not, they will happen. Today her name still stands for style and independence. As haute couture clothing, Chanel reminds us that just because you begin small does not mean you have to end small. We are not all meant to end up as fashion designers and couturiers. That does not mean we cannot be independent, unique, and original in our own way. Coco Chanel did not let this world tell her how to shape her life. Instead, she stood out. The story of how Coco Chanel created her unique style, brand, and fashion legacy is a reminder that each of us has the potential to do many amazing things. It is a hard decision to make and will ALWAYS come with downs as well as ups. In fact, it will probably feel like there are more downs than ups. But the story of couturiers like Chanel can remind us that creating something new isn’t impossible. And it can become something cherished by strangers you’ve never met. Haute Couture is the ultimate in slow fashion. Walking down the high street, we are faced with a new trend every week. The pressure is always on to stay up to date, to wear the correct jean style or show the latest area of skin to be considered “sensual”. Trying to keep up with fast fashion is exhausting, leading to more and more people just giving in and refusing the play the game anymore. Haute Couture offers an alternative that isn’t as out of reach as you may think. Haute Couture is nearly always 100% handmade and will has to include at least one fitting for every outfit they make. These are one of a kind pieces, often made-to-measure for the clientele who can afford it. While most of us aren’t going to be able to afford original made-to-measure outfits that are created by hand, over hours and hours of detailed work, we can take the principal behind this attitude into our wardrobes. That is the attitude of care. When each piece of clothing you make is effectively a piece of art that can never be recreated, you automatically take more care over it. You take time to make sure it is exactly right. The reason that Chanel, Dior, and Givenchy have become so synonymous with luxury is because of this attitude. In slow time and with intensive care, beautiful and astonishing items can be created. Anyone who has seen photographs, let alone the real deal, of Chanel’s wedding dresses from the end of their couture shows knows just how true that is. And because someone puts so much love and attention into haute couture clothing, those of us lucky enough to own some treat it with the same love and attention. What can the world of Haute Couture teach us about living a full, Christ-centred life? Beautiful dresses and custom-made outfits aside, this is an industry founded on prestige and luxury. It hardly seems to have a lot in common with a faith that accepted slaves, women, and unfavourable minorities in the early Church. 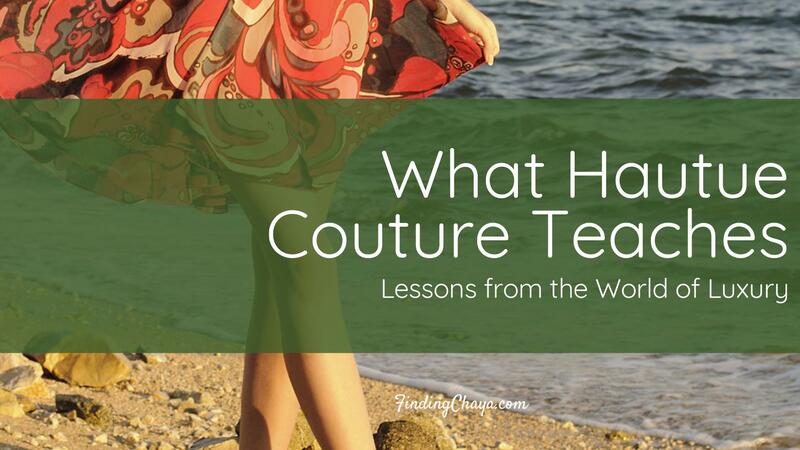 Yet we can still learn a lot from the Haute Couture mindset. First up, be yourself! Yes, being a Christian means that you are called to become more and more Christ-like every day. But you were also intricately made by a God who knew you before you were born (Psalm 139). God doesn’t want you to be shaped by the world; that is not the reason that He created you. Instead, like Chanel making a choice to carve out her own path in the world, God wants us to stand on our own two feet! He didn’t make you so that you could accept the norm. Matthew 7: 24 reminds us that we cannot serve two masters. Just like we can’t serve money and God, we cannot serve society’s expectations and God’s hope for us. Secondly, you are the living equivalent to a piece of haute couture clothing. So nobody is going to try to wear you anytime soon, but that is not what I’m getting at. What I mean is that God has taken time over you. He has designed you and then created you so that you are perfect for where He needs you to be. He took the exact amount of time and care to turn you into you! Psalm 139 says that He knows the number of hairs on our head. That is the mark of a God who knows everything that He has created infinitely and who loves takes all the time He needs to get it exactly right. Moreover, we can learn what it means to create and design in patience. Because our Creator God made us to create. Whether it’s packed lunches or physic theories, table decorations or church tableaus, we are a creative species. But that does not mean that we are to rush around, creating as much as possible. Instead, we can take a Haute Couture approach. Slow down, applying time and care to what we create. Not only will what we create be better than if we rushed it, but we will also be able to enjoy the process. And if a full life can’t include enjoying the act of creation, then what can? What Happened to Christian Fashion?